The first step in troubleshooting any issue with your accounting sync is to check your accounting sync history page. This page tells you what Abacus data has synced into your connected accounting software. If there are any sync errors, they will appear in the Status Column on the right. An incomplete integration to Quickbooks Online can result in a failure to sync. If you’ve hit a roadblock with your Quickbooks Desktop integration, there are a few steps you can take to troubleshoot the issue. 1) Are all of your categories mapped to your active items in your chart of accounts? Abacus gives you the option to add additional data to each expense by setting up custom categories and sub-categories. You can learn how to do this here. After you’ve set up your Abacus Expense Categories, the next step is to map those to your chart of accounts. If you haven’t mapped your Abacus Categories, the sync to Quickbooks Online will break. You can learn how to map your categories to your GL codes here. If you’ve deleted any items on your General Ledger that are mapped to active Abacus categories, the sync will fail. Open up your Categories page in Abacus and match this against your Chart of Accounts. If anything has been deleted from your GL, you’ll need to make the corresponding updates to your Category Mapping in Abacus. Please note: If any changes are made to your chart of accounts in Quickbooks, you must go back to your Categories page in Abacus and re-map them to the updated account! This will not update on its own. If an Abacus category is mapped to an account that no longer exists or has been edited in QBO, it will break the sync. 3) Are your corporate cards mapped to the corresponding card feeds? 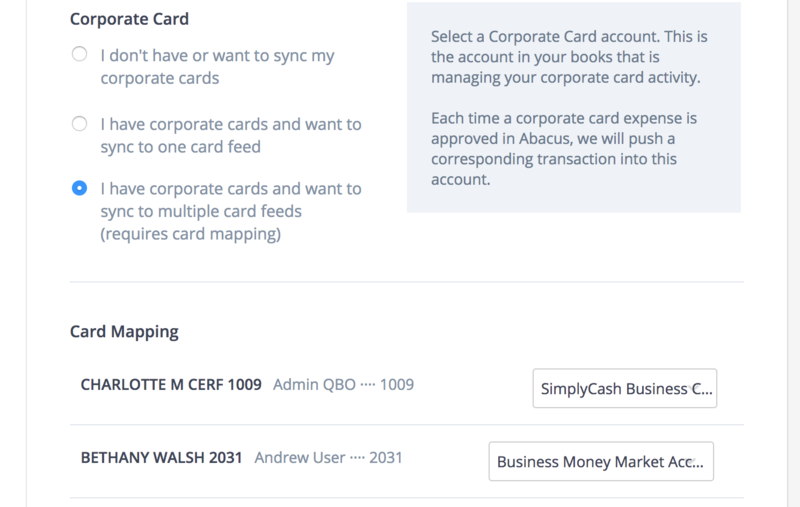 If you are using Abacus for corporate card reconciliation and have selected to sync to multiple card feeds in your Quickbooks, you need to ensure all Abacus Team Cards to the corresponding feeds in Quickbooks. To set this up, go to the accounting sync page and scroll to Corporate Card Expenses at the bottom of the page. 4) Is the person who set up the Integration with Abacus no longer an Admin in Quickbooks? If the person who set up the integration between Abacus and Quickbooks no longer has Admin permissions in Quickbooks or no longer has an active profile, the new Quickbooks administrator must redo the sync. To redo the sync with an active QB admin, please follow this link and enter in the credentials for the active user. 5) Are your Team Fields mapped to your custom fields in Quickbooks? 6) Are your Expense Fields mapped to your Custom Fields in Quickbooks? 7) Is your default expense account up to date? 8) Have you updated your 'close date' in your settings? If you officially close the books in Abacus, you will need to keep this date updated each month in your Abacus settings. If you enter a close date for April 30th, 2018, then any expenses dated before that date will update to a date of May 1st, 2018. You will need to update this date in Abacus each time you close the books!